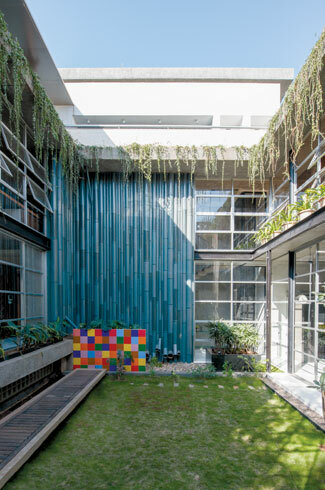 The Collage House in Navi Mumbai stands true to its name; here S+PS Architects have designed a home referencing a sophisticated postcard, full of visuals of the city, both old and new. In its eventful history, the city of Mumbai has earned many epithets. It is popularly known as the city of dreams, in which Bollywood lives and breathes and just cannot seem to tire of eulogising. It is a city of enormous resilience, capable of rising out of smouldering ashes multiple times over. It is a city of mind-numbing bustle, and also of joyous colours and talents. It is also a metropolis of deep contradictions, which sustains them beside each other and lets them foster within themselves parallel worlds. Even though the ‘Collage House’ moves away from the centre of the city into its periphery, finding its feet on Parsik Hill, Navi Mumbai, it carries in its heart the best visuals of Mumbai. 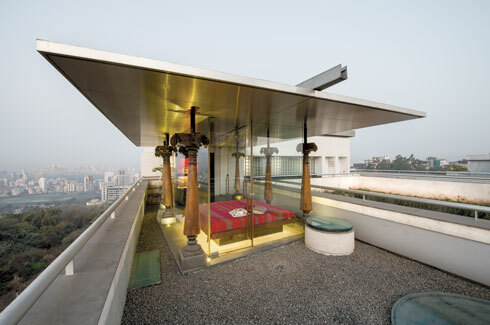 From the bold façade, which dares to be bare and vulnerable in an increasingly well-pruned, concrete landscape, to the spacious, multi-faceted spaces inside, the home is both a homage and a montage dedicated to Mumbai. 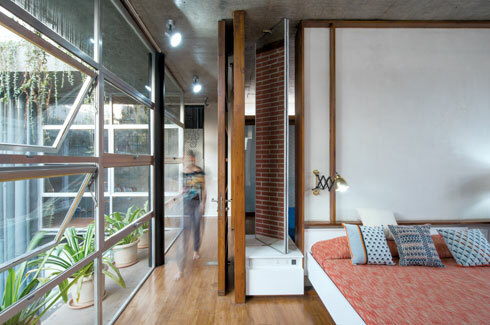 The team from the city-based firm S+PS Architects had a project area of 5,600 sq ft to work with, and it has transformed every inch of it into a glorious totem of modern living in a city of complex histories. The Collage House wears its inspirations on its sleeve. 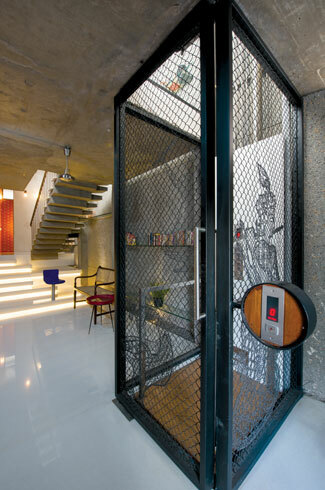 Its tall, broad face is a veritable journal board, full of motivations for the world to see. “A visual language emerges that is of the found object, ad-hoc, eclectic, patched and collaged. An attempt has been made here to apply some of these lessons without romanticising or fetishising them,” states the team. 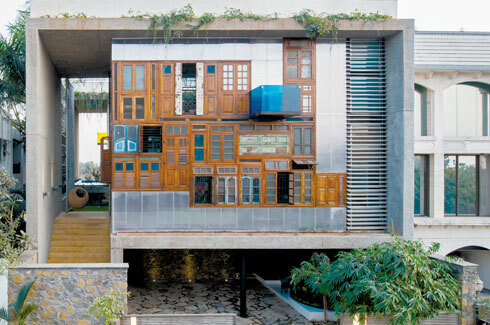 The façade is a collage realised in concrete and ‘found objects’ that scream ‘Mumbai’. 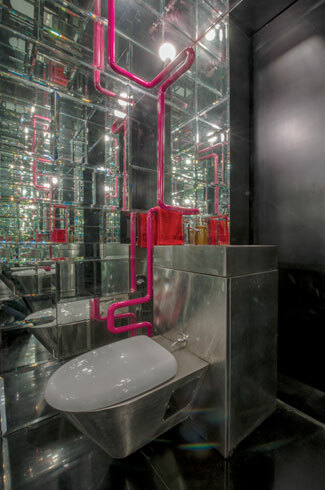 The idea was to include aspects of how a quintessential ‘Mumbaiker’ would live, ingeniously combining limited resources with a fertile imagination, and a legendary propensity towards recycling – in short with an ever-reliable spirit of ‘jugaad’. “The front façade sets the tone for what lies within, with a ‘corner of windows’ that recycles old windows and doors of demolished houses in the city.” These beautiful vestiges of the past, with their delicate arcs and simple carvings are carefully lined up on the outside, evoking aching memories of narrow lanes, two-storey homes, ragged clothes lines, and paint-can plant-holders. The more one takes in the effect of this display, the more one realises what a remarkably powerful visual piece the façade really is. This effect is enhanced in the evenings, when the lights come on and start peeping out through the glass, making it look like a cluster of homes instead of just one. As it happens, this corner of windows is also a hint into what lies inside. It “becomes a major backdrop for the living room with an exposed concrete faceted ceiling above countered by the polished white marble with intricate brass inlay on the floor,” the team explains. The central courtyard continues with this theme of ‘something old, something new’, by placing a riveted rusty scrap metal plate array wall in the same pattern as a surprisingly multi-coloured chequered tile wall. 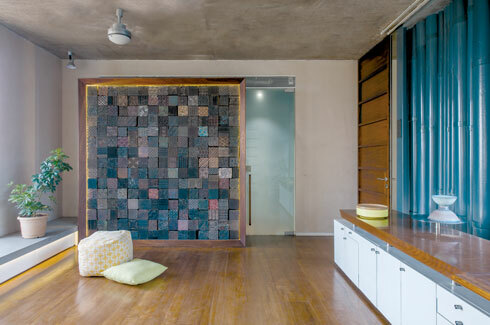 Here too is a stone wall made out of forgotten remnants of stone cutting yards, and of waste carefully collected on this home’s site during construction. The hilly terrain informed the form of this section. “The court is actually raised a floor above the ground level and hidden below is a large rainwater harvesting tank wrapped with rocks that were removed from the hillside during excavation,” adds the team. Cutting through the greyness are plants both potted and freely hanging, sheets of glass windows, and water features. But the stalwart here is the metal ‘pipe wall’, made up of leftovers, but with ambitions of aping a bamboo curtain. A part of it ends in a gaggle of spouts that will bring forth rainwater from the down-take pipes. 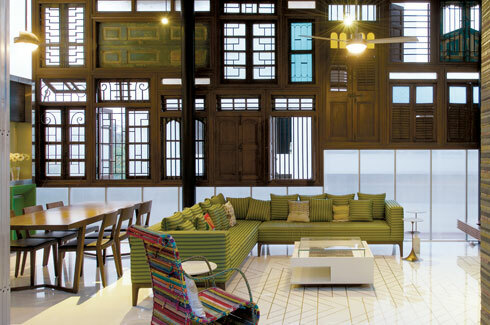 The interiors are a mixed bag – so minimalist, yet so full of beautifully crafted features. 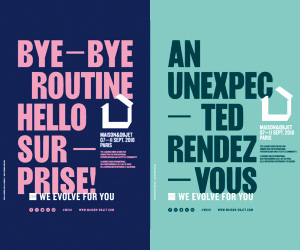 Indeed, figuring out this home’s type and inspirations may well take days. The spaces shift tenors pleasantly, but yet, never really overwhelming the senses. Not always obvious is the firm element of privacy here, an essential facet of a house squeezed within breathing distance of neighbours. 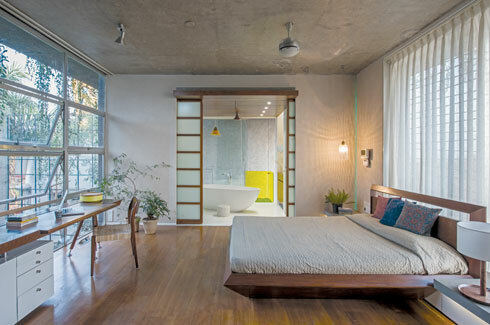 These are slick, modern rooms of seamlessly tiled and smooth wooden floors, beautiful bathrooms and yuppie touches. 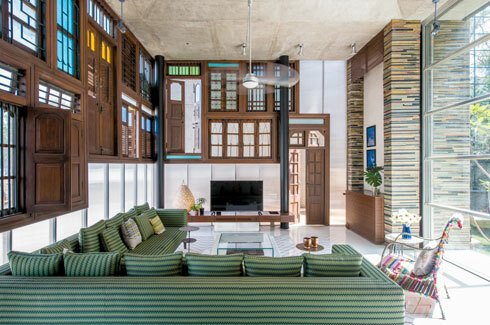 “Present too are traditional elements and materials like carved wooden mouldings, bevelled mirrors, heritage cement tiles, etc.,” the team states. The Collage House is quite literally topped off in brilliant style. Sitting pretty on the terrace in the midst of an even gravel pit, and looking out to the beauteous hilly views beyond, is a pavilion propped up by ornate columns that are a century-old and come from a demolished home. The lightweight structure is formed of steel and glass, and has a solid roof that is affixed with solar panels, that look like they are ready to fly off into the sky any minute. Needless to say, the Collage House is a veritable museum of beauty. It is aware of all that is around and inside it, and makes plenty of accommodations for the people who inhabit it to sit by, relax, and ruminate. What better blessing than this in a setting like Mumbai?